A dashboard camera captured an out-of-control driver swerving across a highway for miles in what became a terrifying drive for so many on the New Jersey highway. Brian Thompson reports. 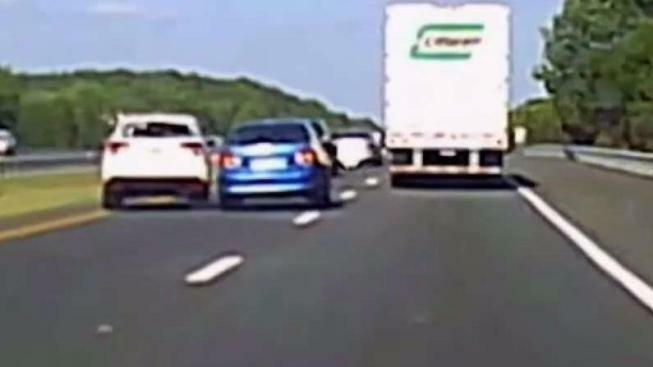 A dashboard camera captured an out-of-control driver swerving across a highway for miles in what became a terrifying drive for many on the New Jersey highway. Motorist John Barrett was heading home from work on the Jersey Shore on June 29 when he spotted a vehicle barreling down the highway at an estimated 100 mph. The driver sideswiped a white SUV, hitting a young Manasquan woman heading home, according to officials. The out-of-control car continued bouncing erratically between lanes, swerving onto both the right and left shoulders, narrowly avoiding disaster for himself and for many others. Barrett followed the driver for roughly 15 miles. "I wanted to make sure state police have an opportunity to capture him, as he was going at high rates of speed," he told News 4 on Monday. "I made sure I maintained a safe distance between him and myself." At one point the erratic driver went so far off the road, he destroyed a highway sign in a burst of fragments. He also spun out, nearly ending up in oncoming traffic. "I honestly thought this would be a much different story for you when he spun out," he said. Finally, a state trooper caught up with the driver and pulled him over. Joseph Scott, 29, was taken into custody. Inside Scott's vehicle, police found heroin and a syringe. He's facing criminal charges for those, in addition to citations for multiple traffic violations. Attorney information for him wasn't immediately clear. "Hopefully this video will show folks to take an Uber or maybe not drive at all," said Barrett.